More than just a diagnostic, AXIS is the catalyst for changing conversations around leadership, management, team and individual performance. AXIS breaks barriers and bias, getting to the source of issues to help you build bridges to better, more productive relationships. The AXIS NeuroPerformance Profile© is a brain-based instrument that provides a map of what you perceive to be the key interdependent factors shaping your perceptions, behaviours and results. The result of over 11 years of research, learning and development, AXIS helps reduce emotional responses as it engages your logical brain to facilitate unbiased, collaborative communication and resolution of issues to build a culture of excellence and success. By informing what conversations or learning initiatives will have the most leverage, AXIS enables your managers and leaders to recognise how to better support you in achieving your full potential. AXIS utilises the neuroscience of performance and decision-making to help you get to the source of individual, team and organisational success, recognising that our brain functions and mindset determine our perspective and corresponding behaviours. picture of the key issues your people are facing, where they are thinking from and what is influencing their performance. AXIS has been built on the recognition that our performance is actually influenced by three interrelated factors. 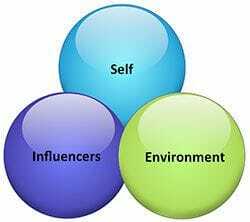 environmental factors internal and external to ourselves and our organisation. By addressing the mindset of your people, AXIS helps you find more effective ways of impacting their behaviours and results.